This 1961 Saab 96 is a 750 cc, 38 hp, three-cylinder, two-stroke rallying machine. 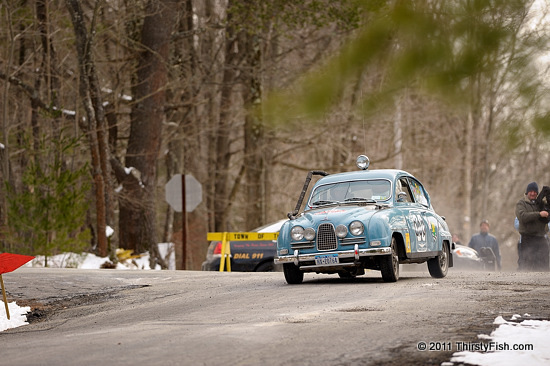 You can see a video of it from the Rally New York 2011 event which it served as Zero Car. This beauty driven by Bruce Turk was also restored by him. The Saab 96 driven by "Mr. Saab" Erik Carlsson, has won the Rally GB event consecutively in 1960, 1961 and 1962. Mr. Saab was also known as "Carlsson on the roof" for occasionally rolling his rally car onto its roof. Before the advent of roll cages, the Saab 96 was one of the early cars with reinforcements in the roof. For Saab, like the other Swedish auto manufacturer Volvo, safety was the key. At the time of this writing, the future of Saab is uncertain and the company faces potential bankruptcy. Volvo has sold its cars division to Chinese based Geely Automobile. The world is truly becoming globalized.